Diary of a Miner: ...Without a paddle! The sun was slowly receding into the Western sky, indicating the coming of the night in but a few hours. It was a good job we only had two sites to go! The next one was located on a small outcropping from the mainland, along the coast. We started off due South to allow us to follow the curve of the land until we hit the right place. The hills and cliffs were back again, but luckily we were able to scale a few of them to get a betted look around. Atop one hill, UOPETA paused for a moment to look through the telescope, roughly in the direction of the next site. From the map, it appeared to be on a flat plain with a few trees, and UOPETA confirmed this, along with an exclamation! I think he found it! "I'll give you three guesses what I just found!" He passed the telescope to me and I took a look in the direction he was pointing. I could see it! A portal off in the distance, once again by the edge of a pool! From this distance, I could even make out that it was an inactive secondary portal! Finally, we were having some luck. We had only destroyed one secondary portal so far, and to find another was better than expected, especially when you considered the fact that we couldn't even guarantee any of these sites possessed a portal! We headed off in the direction we could see the portal, knowing now that there was something there that needed destroying. We would have to use the pickaxe, but at least it meant one more secondary portal was out of action. Well, more than out of action. Totally destroyed! As we got closer, the portal came into view, nestled amongst a few trees and beside a pool of water. I had begun to think again that there were trends that kept popping up in terms of noticeable places. Underground portals were often found in small chambers with moss and lichen decorating the walls, whilst surface ones were often very close to a water source, or a body of water. Maybe we should direct our searches around noticeable areas such as water... I would have to put the theory to OROTHO and see if he could make any sense of it, but I think I was on to something. The portal was actually situated in a very serene location; the pool had a small trickle coming from beneath a hill, generating a calming sound. And the large number of trees meant it was very secluded. It was a very beautiful location, but we didn't have time to admire the scenery. The sun had crept into the lower half of the sky by now and I was worried about losing light. I started with the destruction of this portal, allowing THEROS to examine the map. He said he had spotted some "curious" areas which could hide a secondary portal, so I let him ponder the possibilities. After more or less half of the portal was gone, THEROS stepped in to take over and I looked over the map. We had destroyed a lot of portal over the past few weeks, and it was amazing that we had barely even dented HoN CO.'s progress. We had managed to knock out two primary portals, but even if we managed all of them, how could we destroy the master portal? 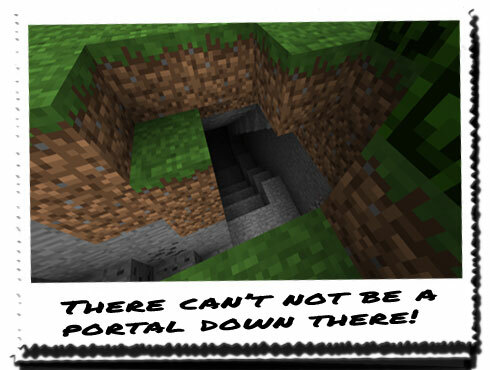 All the primary portals needed to be offline, and even then it was only vulnerable to a pickaxe or a lot of TNT. By a lot, I meant enough to sink the entire tower on top of it! I asked UOPETA if he thought we would win this. He did his best to try and reassure me, but I could tell by his voice that he didn't think we had much of a chance. "We're going up against a massive company with near limitless resources at their disposal and no conscience. We've just got ourselves and what we make and scavenge. We're making progress though... That's the main thing." As the last of the obsidian crumbled into dust and scattered into the pool below, I nodded. We were making progress... Very slowly though... Maybe too slow... Me and THEROS traded items, and we moved off to the North West, towards the final site. We followed the curve of the coastline again, as the next one seemed to be situated close to a beach. This was likely to be the closest portal so far to our base, but who knew how many more there were. The origin of the portals isn't even known, but HoN Co. find them and activate them in the hopes it will activate the master portal. Obviously, now they can activate as many standard portals as they like with the replication technology, which could mean they may just have a cavernous room somewhere underground, stacked from top to bottom with active portals. It was a chilling thought, and it stayed with me until we got to the site. We found a few interesting geological areas close by, but the portal was not located above ground. We moved further inland from the beach, until we stumbled upon a hole that possessed tool marks. "There's definitely something down there..."
We headed down the conveniently carved stairs into the main hole, and then THEROS passed us each a torch. The way forward jumped into view as the torches were ignited one by one, and we proceeded to explore deeper into the cave. There were no more noticeable tool markings further in, but the passage seemed to lead somewhere; it wound round tight corners, often causing us to travel in single file. As we seemed to continue going in circles, we also seemed to descend further into the ground. With each turn of a corner, I expected to meet face to face with a skeletal archer, or a guard... Or worse. But each corner only brought more darkness. "How far does this go? Surely this can't be a natural formation...?" "There are tool markings at the entrance at least. It's not a natural formation at all. Someone carved through here, so it must lead somewhere... If we follow long enough, we'll come to what we're looking for..."
"Well let's just hope it doesn't split off into three separate directions. If it does, I vote we stick together in case each path is trapped..."
"Agreed, but we'll get to that if we find a fork in the passage... If they even lead anywhere!" We continued around for some time; we were quite deep now, and there was no way of determining the time at all. Eventually, we came around a corner, and above us I could see moss on the walls. I placed a hand on UOPETA's shoulder and then pointed up. We stopped, and extinguished the torches. We were engulfed in blackness, but a small amount of purple light emanated from around the next corner. A portal! The sound of echoes and dripping water became audible as we crept closer. We got to the final bend, and one by one we all peered around. What we were met with sent a shiver down my spine. 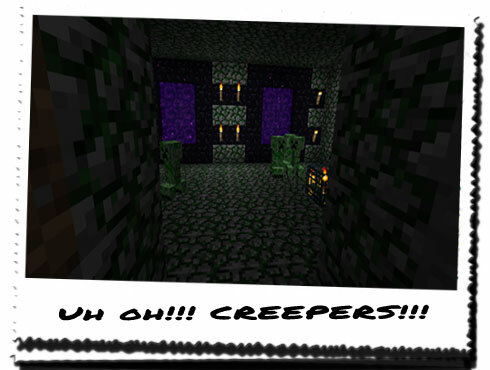 Creepers! We backed off some way so that we could plan without attracting unnecessary attention. There had been at least four Creepers in there, with two active secondary portals embedded into the far wall. Not only that, but there was an Affinitas cage there was well, which would make thigns awkward. "I counted four... That's one for us all plus one. This is how we'll arrange ourselves: Syeonyx and myself will be up front, crouching, whilst THEROS remains behind standing. I take the one on the left, Syeonyx, the one in the middle, and THEROS, the one on the right. The last one goes down by the dart from whoever strikes first! Once the room is clear, THEROS move up and take out the right portal, and Syeonyx you destroy the Affinitas cage in front of it. Then we move onto the next one. Got it? Good!" 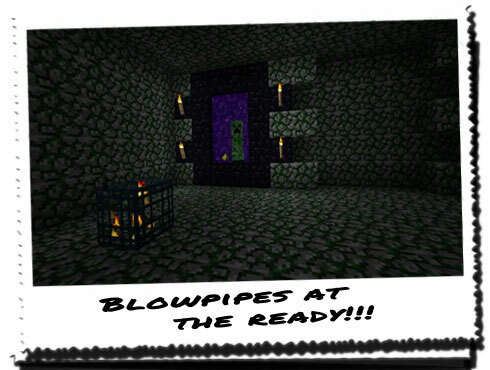 We crept forward again, blowpipes at the ready. Me and UOPETA were up front, and positioned ourselves lower down to THEROS. Once we were in place, UOPETA fired his first dart, followed quickly by two more high pitched whistles. 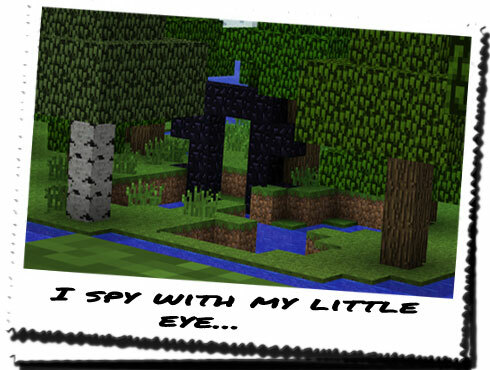 The last Creeper turned to look in the direction of the noise, and three more darts went sailing towards it! They all dropped to the ground, hissing slowly as they sank into unconsciousness. UOPETA gave the thumbs up, and we remained on guard as THEROS took out the Solus stone and placed it on top of the right portal. I began with the Affinitas cage, but it was then that I realised there was another placed in front of the other portal! I hadn't seen it when I had peered around the corner, but no matter. I would destroy it after destroying this one. By the time the first portal was down, the Affinitas cage in front of it was little more than scrap metal! The odd skeleton that had spun wildly inside of it had disappeared in a cloud of smoke, and a shriek, and the flames had died away. THEROS moved onto the next portal, placing the stone on the edge. He then backed off allowing me to destroy the last cage. I brought the head down onto the cage once, before I heard a shout from UOPETA! THEROS stood for a moment in silence, looking at his hand. I couldn't see anything from where I was, so I stood up to take a better look. In his hands, were a few odd shards of what looked like yellow glass... Then I realised what I was looking at! "The stone... 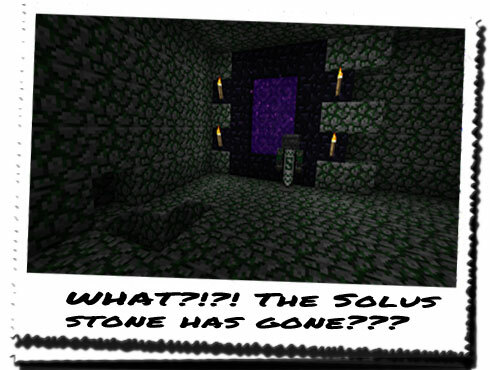 The Creeper has blown up the Solus stone..."
Day 106: To Hell and back!